As some of you may know, the ISSCA Nationals are in Pittsburgh this year from July 23-27... so we are in conflict with our last week in July date of July 27 in Geneva. Any thoughts about this issue? Anybody here planning to go to ISSCA Nats? Should we look at alternate dates for Wagonfest 2019 or continue the event on the prescribed date? BTW I've not been to an ISSCA National event. In fact I missed it when it was just down the road from me last year. My car didn't have a front on it at the time and I was scrambling to get it ready for WF 2018. I just submitted an inquiry to the Geneva BID (Business Improvement District). They determine the date for Cruise Night in Geneva, and in the past it has been linked to Wagonfest NY. Important to some who generally attend Wagonfest NY. I'm happy to help with local arrangements, whatever the date, as I have possibly the shortest commute. As you know having WF NY in sync with the Geneva car show is important to many of us. I don't go to the show every year, but at least every other. If we start messing around with the dates, that will probably take away from attendance at WF. Just my own 2 cents: having the dates the same as the National show probably won't make any difference in attendance, as for the most part, we are two different groups. Didn't we already go through this once before ... Like last year and even went to a vote where people like to go the the Geneva car cruise as well as WF. I would think that we should continue to marry them up and stay like this going forward. Just me thinking out loud!!! Agreed on the Geneva show - and it does seem this is on the same weekend every year. Syracuse Nationals is definitely fun to go to once if you haven't been. Generally, but not always, Cruise Night is the same weekend every year. 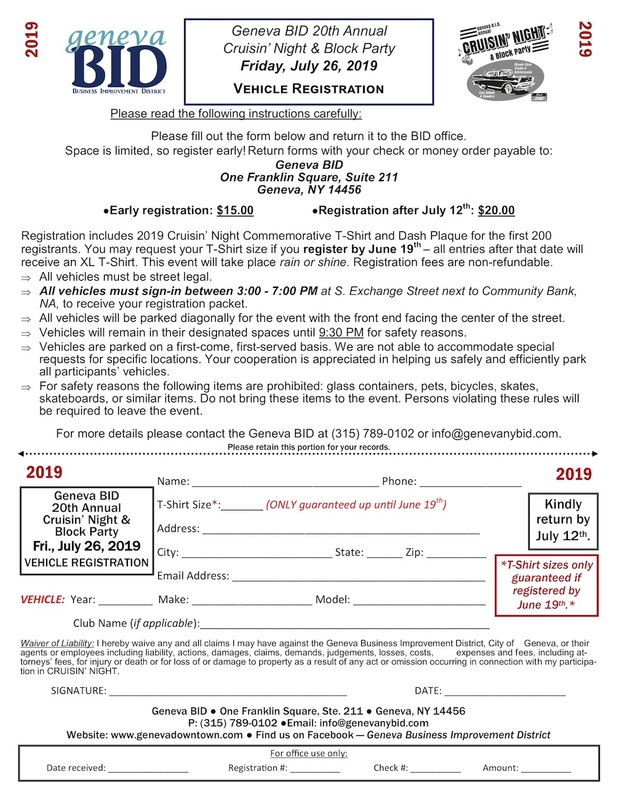 The July 2019 event calendar is now posted on the Geneva BID website, but Cruise Night is not on it. I'll get in touch with them on Monday and see what's up. It's official. Geneva BID (Business Improvement District) has set the date for Cruise Night: Friday 26 July 2019. So, Wagonfest NY 2019 on Saturday 27 July? Vehicle registration form is attached. So is Wagonfest happening this year? I'm assuming the date will coincide with weekend of Cruisin' Night. There is a great but small and relaxed car show at Goose Watch Winery the weekend before and I'll likely be there too. I'll post a link to that when it becomes available. I called the microtel, they didn't know of a group rate. I'm assuming I got the weekend and location right. But since I've never actually stayed at the host hotel, am a late confirmation the times i went in 2012 and 2018, I could have got it wrong. I was considering stopping in Pittsburgh Thursday night to hang in the parking lot at ISSF Nats. The Glenn could be fun, I enjoyed it the year I did that. Other than the stock brakes and their terrifying brake fade on lap 2. This year I'll have something with better custom brakes and am interested in punishing them. But, the Glenn isn't a necessity. Brewery hopping with stops at waterfalls along the way sounds like a good time. That's what we did last year. If WFNY 19 doesn't gain steam, there is always the option of Wagonfest Michigan 2019. I could host it in the Benton Harbor, mi area. South West coast, not the Detroit area. It's a similar area to the finger lakes region. A tourist area with beaches, wineries, breweries, downtown street events in Saint Joseph, Bridgman, and Benton Harbor. I made a post about this on Facebook in the b-body wagon mafia group. So you actually going to drive to NY for wagonfest? Perhaps an idea might be to hold wagonfest at the nats? Tom has booked a block of rooms at the Microtel (see the thread he started). I've booked the tent at our customary site on Seneca Lake for 27 July. Cruising Night in Geneva is Friday, 26 July (see form above). I'll look in to the possibility of a run on the Watkins Glen track if 3 or 4 other cars/drivers are interested. I'm local in Geneva, so let me know if you want to organize a winery or brewery tour, a scenic drive, or a cookout. I think this will be the 15th Wagonfest NY, so come on down. As the attendee list grows, I'll see if there are enough interested to organize something for around 4PM Friday night before Wagonfest NY in Geneva. It's a nice drive down the west side of Seneca Lake to Watkins Glen.